The Chevrolet Volt electric car from GM invariably is mentioned in my economics classes whenever the discussion turns to alternative energies. It is often held up as the “car of the future” and a paragon of the green economy transforming the United States. While I would be delighted to see the Volt reach these aspirations, I question whether those who have pinned high hopes on this vehicle have actually considered the data. Readers of Above All Earthly Powers are encouraged to research the data rather than be swayed by headlines and soundbites. GM expects sales to fall short of 45,000 Volts this year. This likely will prove true, given that only 7,600 were sold last year. 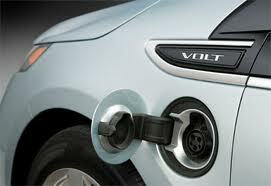 In other words, of the 12.8 million vehicls sold in the United States last year, 99.95% of them were not Chevy Volts. It is also safe to assume that essentially 100% of the 18.5 million automobiles sold in China last year were not Chevy Volts. What could account for this failure to revolutionize the auto industry by this innovative green product? One contributor could be the $41,000 price tag on a vehicle smaller than the Ford Fusion (2011 record sales: 240,000 vehicles). Of course this steep price is partially offset by a $7,500 government rebate which is coerced from non-green taxpayers who otherwise might not donate to save the planet. This sales incentive seems reasonable in light of the fact that the federal government still owns 26% of General Motors outstanding common stock. Gentle reader, we should care about the environment. For this reason, future posts will address how to care for the creation with ideas that keep individuals safe from fires, are cost-effective in light of poverty, and produce actual change rather than “green washed” corporate public relations. 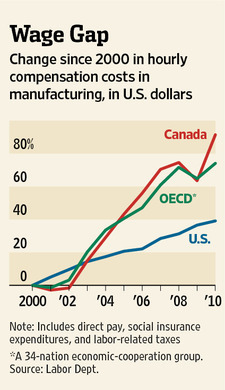 Manufacturers have used automation and flexible work practices to make far more goods with the same amount of people. This increased productivity results from ideas which make the unit labor cost of goods lower without reducing wages to the workers. The Journal reports that costs in the United States have declined by 13% over last decade compared with increases of up to 18% in Germany, Canada, and South Korea. 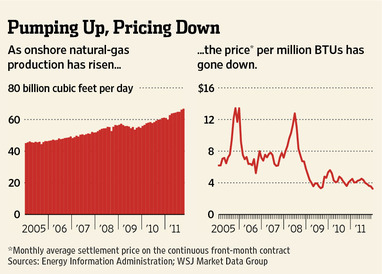 The United States also benefits from lower energy costs from the shale-gas boom that is underway (look for posts on this in the near future — DSK). Logistics and transportation are better in the United States than most countries. Though it goes counter to the prevailing sentiment, manufacturing and United States is growing more attractive to companies around the world. Do you know someone who is a “nervous flyer”? Is it dangerous to fly in the United States? Once again, it is helpful to look at the statistics rather than relying on our personal inclinations. 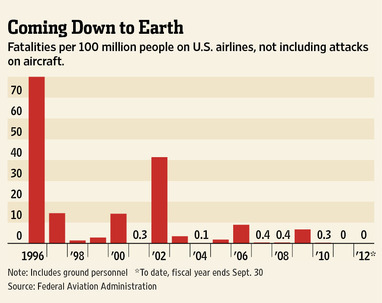 The Wall Street Journal reported today that there were no fatalities on scheduled U.S. flights in 2011. In fact, the fatal-crash rate for scheduled carriers is down 80% since the late 1990’s. A plane crash is always headline news; few papers report, “America’s skies are the safest they have ever been,” according to Transportation Secretary Ray LaHood. As a result, we can be grateful to God that for the average person the fastest way to travel great distances is also the safest — likely for the first time in the history of mankind. This mobility is of inestimable benefit for commerce, recreation, and family ties. Also, this shows us how our individual views can be biased in the absence of wider statistical information. In this way economic data — properly interpreted — can help finite individuals better see the world from the perspective of an omniscient God. The vibrant and prosperous economies of Japan and South Korea are evident from the city lights radiating into space. 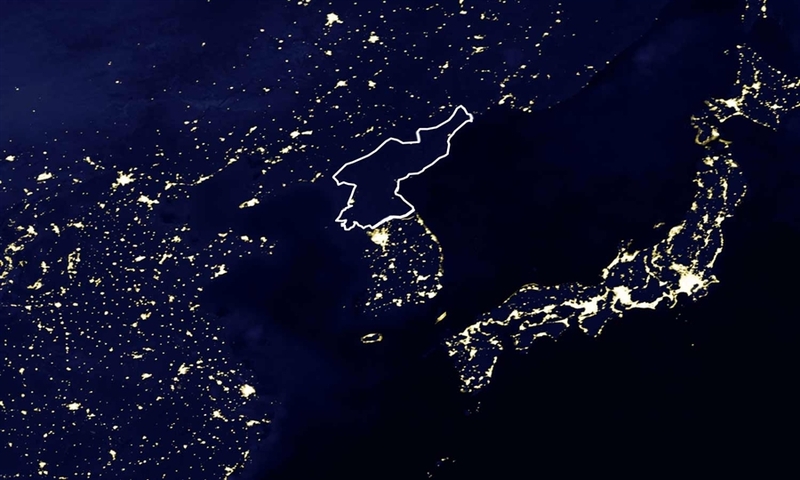 The white outline added to this satellite photo highlights the “missing” cities of North Korea. Surrounded by prosperity, the people of North Korea have been literally starving by the millions. The people of the Korean Peninsula share a common geography, a common culture, and until recently, a common history. The only significant difference between the North and South was an economic commitment to communism or to capitalism. Ideas matter. Economic ideas matter to the lives of millions of people. Gentle reader, I am grateful that you have found this blog and hope you will join in the dialogue as we explore the theological significance of economic choices for people around the world.